Hull 8mm galvanised steel built in 2000 by the META yard now famous for it's patented STRONGALL construction process) This is and topped off with a balsa sandwich GRP superstructure from the CPC yard more commonly known under the trading name of RECLA and well respected for the construction of solid hire and private vessels. Interior fitout is with marine grade ply and solid Elm. The quality of the interior and exterior construction is evident throughout. Coastal & inland motor cruiser for sale in France. Boatshed Bourgogne is pleased to offer this unique steel hulled Tarpon 49 C cat. Motor cruiser for sale in Burgundy. A spacious bright & airy cruiser with oceans of space inside and outside. This vessel gave rise to a whole fleet of both private & hire versions of the Tarpon 49 and though it has always remained in the hands of the builder / hirer it has been very little used and well maintained. 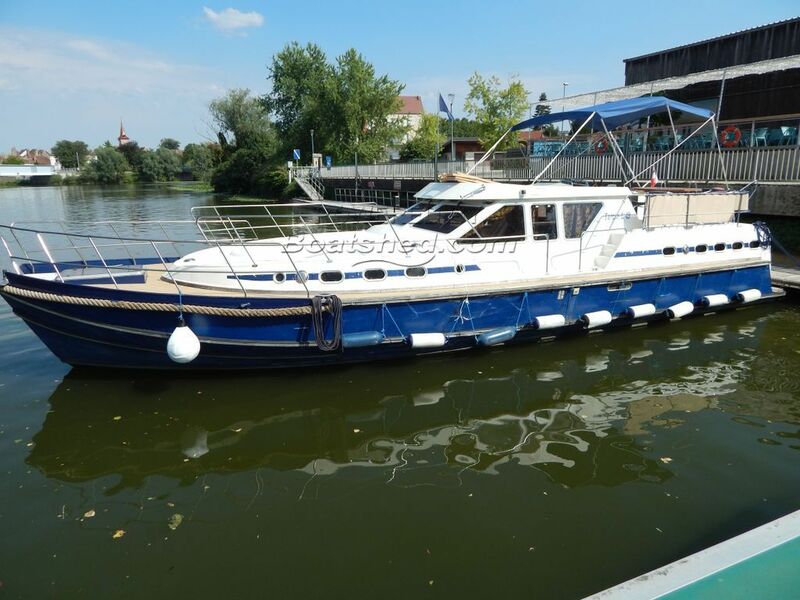 A spacious motor cruiser for the French waterways and ideal dimensions for comfortable Rhine, Main, Danube “circumnavigation” For more information and appointments to view, please contact Graham WHARMBY your Boatshed broker at Boatshed Bourgogne. This RECLA TARPON L49 Unique TARPON 8mm Galvanised Steel Hull has been personally photographed and viewed by Graham WHARMBY of Boatshed Bourgogne. Click here for contact details.